In stock - low quantity. Order in the next 7 hours, 52 minutes and it will go out today! This high quality production item from Tora Magic is ideal for either a themed act or simply as a shocking moment in your show. 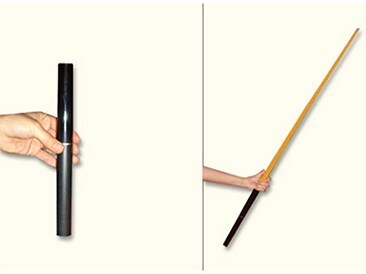 The telescoping prop begins a little larger than a foot in length, and telescopes to a huge, full-size pool cue. The ideal use for this prop would be as a final production after a billiard ball manipulation routine. The cue is made of high quality materials and will last a lifetime. Billiard Stick size: 34.5 cm compacted, and fully extended it is an amazing 148 cm.